In the frustrating and creating more work for us category, what you see above is the remnants of my clothesline. 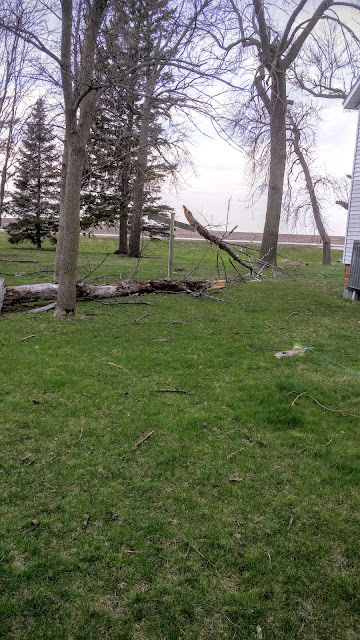 We had a dead tree fall on Tuesday and take out the clothesline. Both poles will have to be replaced as well as the line. We are extremely fortunate that the tree did not fall on the house or fall the other way on to the power line. This can be cleaned up and replaced fairly easily. Gardening is still on hold. The ground temperature is a little bit chilly yet to plant anything. A few days of sun might cure that. We are also going to move the raspberry patch out of the garden and into its own spot. I think they will do better and I will have the room back in the garden. If I don't have a tiller (my dream tiller) by the weekend, I will rent one and get the garden tilled hopefully in the next week. We (mostly Rob) spring-cleaned the first floor of the house Saturday. He would call it normal cleaning, but the floors look fantastic! We also did some decluttering with another load accumulating for the thrift store. I took one load on Thursday last week, but we always have more things to get rid of. I also did a big grocery run on Saturday. Meat prices are atrocious!!!! Corn and beans for feed is down. Gas prices to transport the meat is down. Why is ground beef still $4.50-5.00 a pound?!?! Crock-pot and arm roasts were $3.99 a pound. I am still in sticker shock! Everything is on hold this week while we get ready for prom! Paige is going to her first prom on Saturday and, in our true frugal style, is wearing a dress that Jordan wore her junior year. I still need to get a few repairs done on the dress and iron the skirt. With three track meets this week this should be interesting, but we will get it done! 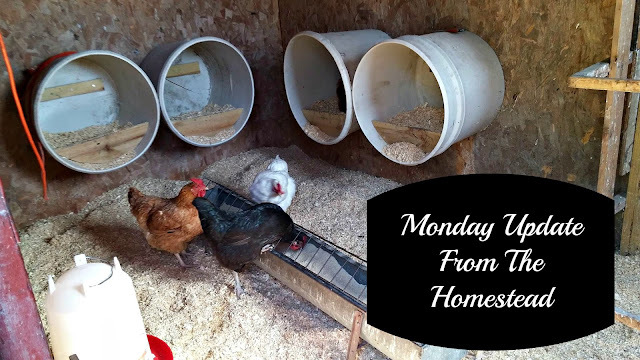 What is happening on your homestead?